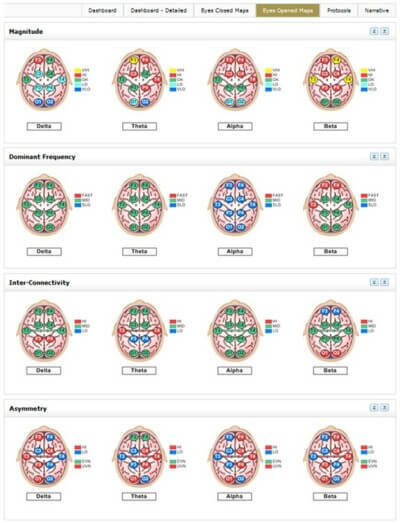 BrainCore Therapy provides a unique and drugless approach to treating brainwave dysregulation that may be associated with the symptoms of many neurologically based conditions. The theory of neurofeedback is based on a simple concept – When you have information on what your brainwaves are doing, your brain can use that information to change how it works. 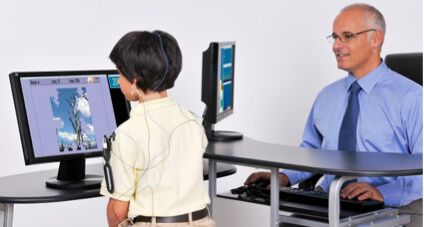 BrainCore Neurofeedback is also known as EEG Biofeedback. Neurofeedback is guided exercise for the brain. It is actually a learning modality designed to retrain dysregulated brainwave patterns. 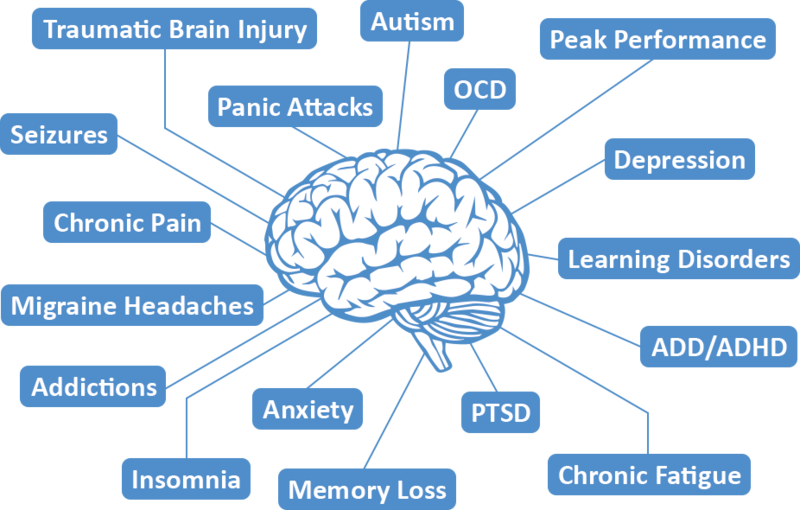 Neurofeedback should play a major therapeutic role in many difficult areas. of efficacy it would be universally accepted and widely used. Dr. Frank H. Duffy, Professor and Pediatric Neurologist at Harvard Medical School. The software automatically detects when the brainwaves are properly ordered and it feeds that information back to the patient. This feedback appears in the form of a game, movie, or sound which signals the patient that the brainwaves are becoming more ordered. For example, in the image in this section, the patient is watching a puzzle of a picture that is being filled in piece by piece. As long as the patient’s brain waves are moving in an orderly direction, the puzzle pieces are filled in and the patient hears a tone. If the brainwave patterns move away from an orderly pattern, then the puzzle does not get filled in and no tone is produced. The patient is actually controlling the completion of the puzzle with their brain and by doing so; the brain is learning how to regulate itself. How does neurofeedback work? In another design, the patient performs the training while watching a movie. In this case the patient may watch a DVD movie that is being controlled by their ability to regulate their brainwaves. The movie will get brighter as the brain waves normalize and become darker when they become dysregulated. Brain core therapy, also known as neurofeedback, is safe and generally causes no side-effects for most patients. The first step is an assessment to go over a patient’s history. After the assessment, sensors are placed on the head that measure brain waves as patients are asked to complete certain tasks or assignments. These sensors cause no pain and do not emit any type of electricity. The process serves two purposes: 1) measurement of brain waves and 2) helps therapist determine how the brain is responding to certain stimuli. With these two determinations the therapist can help the patient learn how to control their brain waves. Most patients see significant improvement in their brain dysfunction within a few weeks of consistent sessions. Brain core or neurofeedback patients report that the positive effects of brain core therapy lasts long after they stop the sessions. The probable reason for this is that during brain core therapy patients are taking control over how their brain reacts to certain stimuli. Once they master this, they can continue to use that skill without ongoing sessions. A few patients need a “refresher” session to get back on track. This greatly differs from continuously taking medications or participating in therapy that only deals with the symptoms. So often people suffering from any type of brain dysfunction is automatically given prescribed medications to relieve their symptoms. In most cases, patients feel some sort of relief with the medications, for a short while. What ends up happening is that the body can build a resistance to the drug and a doctor may prescribe a higher dose or an alternative, stronger medication. The side-effects can also compound a brain disorder. Additionally, the health risks and consequences of many mind altering medications have not been determined, especially in children. Brain core therapy patients can reduce their intake of medications and in many cases they can stop taking prescribed drugs after consulting with their primary care doctors. Here you will find the culmination of more than 40 years of university based, medical research demonstrating the effectiveness of this therapy for many different conditions.